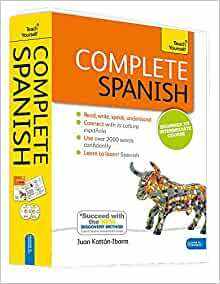 Complete Spanish with Two Audio CDs provides a clear and comprehensive approach to Spanish, designed for anyone who wants reach an intermediate level in all four skills--reading, writing, listening and speaking. your own pace through authentic conversations, detailed language and grammar explanations, and extensive practice and review. You will learn what you want to say and when to say it―everything from giving opinions to planning events. Juan KattÃ¡n-Ibarra holds degrees in foreign-language teaching from the Universities of Chile, Michigan State and London. He taught Spanish at Ealing College and Shell International and was an examiner for the University of London School Examinations Board. He now lives and works in Chile. 4.0 out of 5 starsIt sparked an interest in me. I have been studying Spanish on and off for a few years. I have another workbook and used Berlitz Basic Spanish, which I got bored of. I really was never interested in the language, it was always a curiosity. However, this somehow sparked a certain interest in me. I have heard of the Teach Yourself series, and I wanted to see what it was all about. I chose a language that I was familiar with to focus my opinion on the series. I really do enjoy the series. I have been using it close to a month. It comes in a very pretty box I think protects the book and CD. I noticed how nice the book looks and how colorful it is. I saw the older versions and it is an upgrade. Color catches my attention. I felt a little excited to use it because of the way it looked. I had literally forgotten what language it was until the first lesson. I am still using it, and I feel safe and easy. Little by little new information is presented. It does tap into what one learned before and builds on that, which is the best way I learn. Even the way grammar is given. I love grammar when it comes to language and tend to overdue it. That makes me forget the majority of what I would learn. Here the book gives just enough to see how the sentences are made within the script and learn what is what. (what a noun, verb, etc. is) I enjoy the cultural tips. I usually would have to google them and that only happens when I want to, which is rare. I like the speed of the voices on the audio; slow enough to grab every word but not to the point where I feel like they're treating me like a idiot. I like the Castilian accent that is used because that is my favorite one. I don't like the amount of English the audio uses. It is only reading the directions on the page back to me and telling me to do the instructions. That is annoying. I find the exercises a bit tedious but I also see they help with remembering. In conclusion, I really enjoy the Teach Yourself series. I do recommend this to anyone who is either dying to learn Spanish or, like me, satifying a curiosity from time to time. It is worth the money. That is coming from someone who is REALLY cheap! 5.0 out of 5 starsPerfect to learn Spanish! Still working through this book...this is the second system I have purchased from Juan Kattan-Ibarra, and his books are truly in a teach yourself format that you can use to teach your entire family! I liked at first, but by the time I used the second CD and realized it wasn't working properly. It was too late to return. So I haven't used anymore. It is very basic but has good information for someone just starting out. I was looking to get closer to fluency and this book is not for that. Product is as described but the shipping took 21 days to ship from NY to Ohio. It was way longer than I expected.